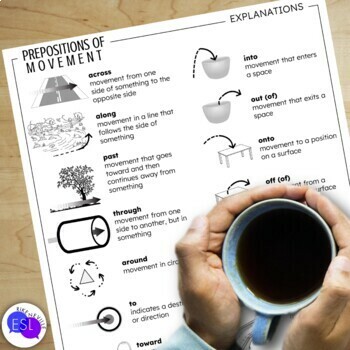 Prepositions of movement are something all of your adult ESL students need to master whether they are learning English to pass English-proficiency exams for university admittance, to understand and be understood in their workplace, or just for fun. Take back your free time with this resource. No need to prepare anything or hunt for appropriate supplemental material because I've already done it for you. More practice with prepositions is an often-made request from adult ESL students. Now you'll have them covered. 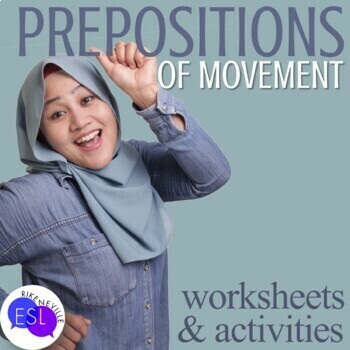 With activities for both speaking and moving, a linguistic investigation, and more traditional worksheets, you will be able to present your students with a variety of preposition practice. The following prepositions are used: across | along | around | down | from | into | off of | onto | out of | over | past | through | to | toward | under | up. 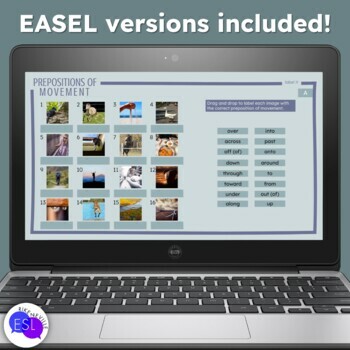 This resource was created for mid-beginners to low-intermediate adult students. Nothing is inappropriate for children, but the sentences were written for adult interest. ✔ Answer key for labeling worksheet.